Many of us think about a better world. But opinions may vary over how to get there, and especially about what “there” we want. The imagination and realization of worlds has become a driving force in “real” and ”virtual” environments, with both negative and positive consequences. 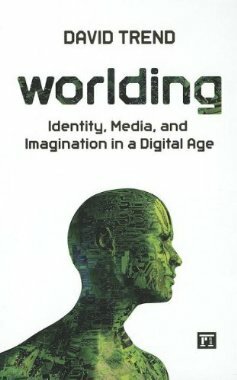 Worlding: Identity, Media, and Imagination in a Digital Age explores the many realms of experience we inhabit as we move back-and-forth between reality and representation in our daily lives. But in doing so, Worlding concentrates on ways of improving our common existence. As discussed throughout this book, “worlding” can be selfless or selfish. It can reinforce what exists or point to something else. But it can never be neutral. Throughout this book, “worlding” will be examined as a word, an argument, and a possibility. Worlding is a word. You won’t find the term worlding in any dictionary, even though the term has been in use for nearly a century. Martin Heidegger popularized the neologism in his 1927 Being and Time to mean “being-in-the-world.”The idea was to use a verb signifying something ongoing and generative, which could not be reduced to either a philosophical state or a scientific materiality. Since then worlding has appeared dozens of times in philosophy, politics, cultural studies, and technology studies. The word has been appropriated, contested, but never quite pinned down––and so retains a remarkable flexibility. In “Ways of Worlding,” P.J. Rusnak catalogues many of the ways worlding has been treated in different disciplines and for varying purposes. Noting the term’s Heideggerian ontology, Rusnak cites worlding in discussions of colonialism and imperialism, secularism and faith, patriarchy and heteronormality, utopian and dystopian futurism, aesthetics and artistic expression, online networking and virtual community building, ecology and sustainability, proprioception and kinesthesia, pedagogy and situated learning. Linguists have taught us that terms like “worlding” work less as fixed essences than as mediators of differences among the utterances and concepts around them. But this undetermined character hardly makes “worlding” innocent, deriving as it does from a noun referencing concepts of origins, boundaries, ethnicities, governance, and even consciousness itself. It is to this broad vision of worlding that this book dedicates itself. Worlding is an argument. World News, World Record, World Bank––the list of world things is endless, generally conjuring up presumptions of totality or neutrality. But we know the limits of these conceits. Nothing using the term “world” is complete or neutral. The very slipperiness of the term means that it can be taken in negative or positive directions. To some the word conjures up images of sovereignty, while to others it might mean the creation a new domain. But in either case, “world” and “worlding” are loaded terms. For this reason, Worlding: Identity, Imagination, and Reality in a Digital Age takes a stance within a field of indeterminacy––a stance against those who claim to have answers or certainty, especially those who prescribe to others. This is not the same as saying that values do not exist, or that we even need to choose sides in an absolutist/relativist divide. Worlding takes the view that the divide itself is the problem, rooted as it is in an inherited binary consciousness that we struggle with every day in debates over good/evil, mind/body, center/margin, and so on. Without getting too philosophical about this, Worlding embraces the connection between thinking and being. Worlding is a possibility. Disagreements over terms like worlding point to the importance of dialogue––the primacy of communication and the exchange of ideas. Put another way, worlding can be about ways we educate each other. The UC Santa Cruz Worlding Project perhaps put is best in describing worlding as a “field imaginary” unbound by definition or convention, yet guided by curiosity and openness. Worlding can be a way to critique an existing moment or a means to envision a utopian space that does not yet exist. This book is about the worlds we conceive for ourselves in relation to the world we find ourselves inhabiting. In other words, in this “world” thinking and being are not separated in ways that isolate or obfuscate complexity in the interest of expediency. Worlding is messy, indeterminate, and never ending. As such worlding requires us to talk to each other and to always remember the limits of any perspective. For information and orders, contact Paradigm Publishers.